So, you are now interested in taking the GNC Lean Shake product. It is basically a shake that contains lots of proteins, aimed for weight loss and body building. However, you may have come across two different GNC Lean Shake products, which are GNC Lean Shake Burn and GNC Lean Shake 25. And now you are wondering what the difference is between these two different products. Well, you have come to the right place! Below, we will see the differences between these two protein shakes to determine which one will be the most suitable for you. GNC Lean Shake Burn is a protein shake that has been geared towards weight loss and bodybuilding by increasing the metabolism rate of the body. By increasing the metabolism rate, GNC Lean Shake Burn is able to break down the fat molecules in your body to be transformed into energy. That’s why GNC Lean Shake Burn claims to be able to increase your energy levels as well. Because of its capability to increase your body’s energy levels, it is an excellent choice for a supplement before a workout. The increased energy will help you train more, making your workout session to be more effective. Nevertheless, because of the primary mechanism, GNC Lean Shake Burn is most suitable for people who actively exercise and workout. If you don’t exercise regularly, you will not get the fullest benefit from GNC Lean Shake Burn. Each serving of GNC Lean Shake Burn contains about 30 grams of protein. That is quite a big amount. Protein is used by the body to build new muscles. However, the amounts of sugar, fiber, and total calories are all lower here. On the other hand, GNC Lean Shake 25 focuses more on the weight loss aspect. Compared to GNC Lean Shake Burn, GNC Lean Shake 25 contains less protein, only 25 grams per serving, but it contains more fiber and calories. The increased amounts of fiber and calories allow v 25 to act as a meal replacement. It will help to keep down your appetite. This way, you will not get hungry as often as usual, effectively lowering your calorie intake. At the same time, GNC Lean Shake 25 also enhances the metabolism, though not as much as GNC Lean Shake Burn. The protein content will help in creating new muscles. GNC Lean Shake 25 is more suitable for people who don’t work out very often and are looking for a simple weight loss supplement. - Lean Shake Burn - Losing Never Felt This Good! 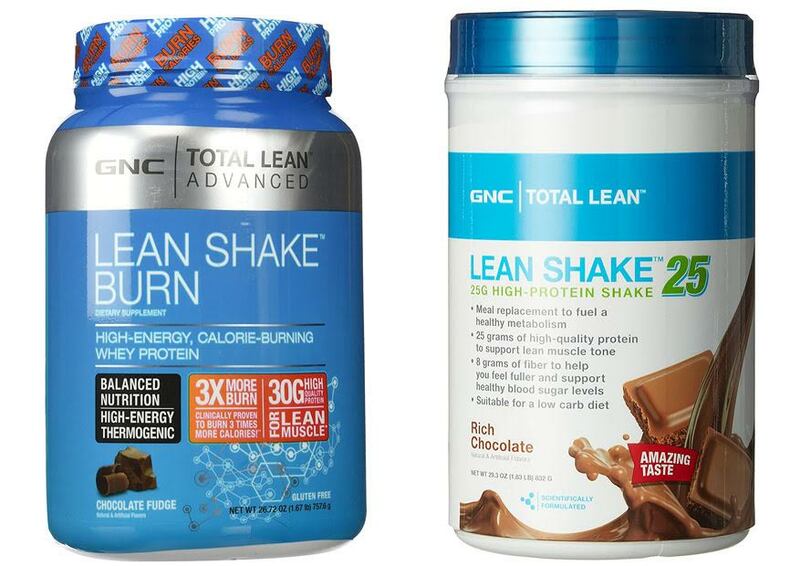 For a supplement before a workout, GNC Lean Shake Burn should be your choice. The increased energy will help you in exercising more effectively. On the other hand, you should choose GNC Lean Shake 25 if you are looking for a simple weight-loss supplement that can act as a meal replacement.